Shop for Average Outdoorsman T-shirts and Car Decals here at the Outdoorsman Store. One of a kind design that can only be found here on AverageOutdoorsman.com Store. Average Outdoorsman t-shirts are made from 5.3 ounce 100% pre-shrunk cotton. Complete with double needle sleeves and hem, these t-shirts should last a long time. The sizing is right on with regular standards so there is no need to up-size or down-size on your order. 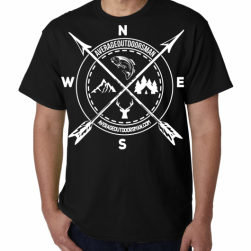 The Average Outdoorsman t-shirt is black in color with a white Average Outdoorsman logo. The logo is a full size 12″H x 12″W and covers the full front of the shirt. These t-shirts really stand out and look awesome! Standard shipping is included in the price. The Average Outdoorsman car decals are 4″ x 4″ and features the Average Outdoorsman logo. The car decals are a great way to show your love of everything in the great outdoors.